Traffic: The Miniseries is a three-part feature on the United States cable channel USA Network in 2004 featuring an ensemble cast portraying the complex world of drugs, their distribution, the associated violence, and the wide variety of people whose lives are touched by it all. The mini-series was partially shot in Kamloops, Ashcroft, and Cache Creek, B.C. standing in for Afghanistan. It was inspired by the 1989 television miniseries Traffik made by Channel 4 in Britain and the 2000 motion picture Traffic directed by Steven Soderbergh. The American version was nominated for three Emmy Awards. 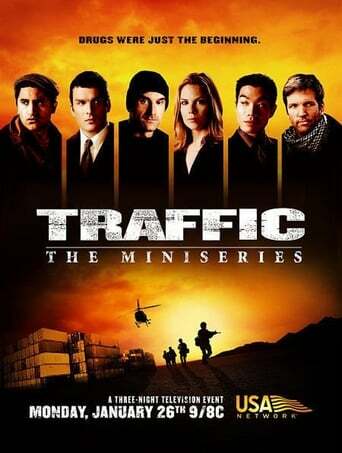 Traffic: The Miniseries was directed by Eric Bross and Stephen Hopkins and written by Ron Hutchinson. The cast is composed of principal actors Cliff Curtis, Martin Donovan, Balthazar Getty, Elias Koteas, Mary McCormack, Ritchie Coster, Nelson Lee, and Tony Musante, while the supporting cast includes Justin Chatwin, Jennifer Rae Westley, Katia Khatchadourian, Johanna Olson, and Brian George.